I have lived in Iowa my entire life so I'm no stranger to tornadoes. After the tornado that hit Moore, Oklahoma yesterday, including destroying two elementary schools, I can't help but think of tornado safety in schools. Just like in Oklahoma, the same goes for Iowa, the tornado shelters include restrooms, locker rooms and hallways. 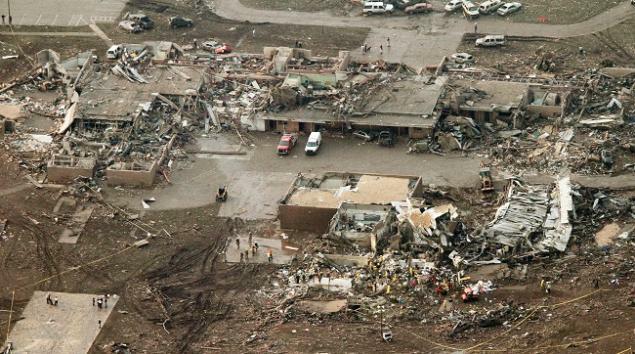 If you live in tornado alley, you know that the safest place to be is underground. Luckily in Iowa, most people have basements under their houses. It does not sound that very many people in this part of Oklahoma yesterday had underground shelters or basements. So if we know the safest place to be is underground when a tornado is approaching, why don't we have underground shelters for our children in our schools to go to? I can't help but think of a tornado that hit around this time five years ago in Parkersburg, Iowa. It happened on Graduation Sunday, as many people were coming home from graduation parties. Luckily, this tornado didn't hit while school was in session. Before the tornado, Aplington-Parkersburg High School had similar tornado shelters in it's school just like in Moore, Oklahoma - hallways, bathrooms, etc. After the tornado, Aplington-Parkersburg High School had to rebuild and with that rebuild they built a concrete re-enforced underground wrestling room that doubles as a storm shelter, with enough room to house the student body twice over. I think this is something every school should consider not only for it's students, but for it's community. I think about how bonds are passed for a new gym or a new auditorium or a new football field, why not pass a bond for a storm shelter? My heart breaks for those in Moore, Oklahoma and other places that have been devastated the last couple of days. During the aftermath of these tornadoes, I hope schools and communities throughout tornado alley think about what should be done for safety. You got a point there, Val. It's now a must for everyone who live in a tornado-prone areas to install a shelter room in order to avoid certain physical damage. Storm chooses nothing and no one when it blows. Everybody's gonna be hurt, regardless of your social standing. All that we can do is find a place where we can be safe. Thanks for stopping by Edwina. I see that including a shelter area at the school if there is an addition or new construction as a no brainer. A shelter area at the school could also possibly be used by community members too.